Improvise...Improvise....Story of my life! I had an extra reindeer from yesterdays tag, so that's what I used in place of the tree die. No Snowflake Die either, so I embossed some snowflakes from the Artistic Outpost Snowy Woods Plate. My dictionary page must be really OLD as it's very yellow, thus the emboss resist does not pop like Tim's Tag 11. 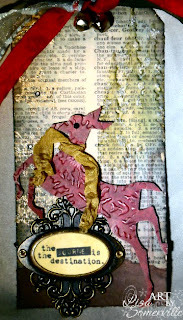 I embossed and highlighted the Tree folder behind the reindeer and added a bit of Silver and Polar White Flower Soft. The reindeer is covered with Memory Box paper and embossed with the Snowflake Texture Fades Folder. Wonderful tag Lisa ! I love the scarf and words. My resist didn't show up great so I put velum over it. Where there is a will -there is a way. See u tomorrow for the last one. Lisa, this is so cool! I love how you improvise!! Mine will be the 12 Tags after Christmas!!! Enjoy! Another terrific tag, Its great how you make it your own! Beautiful! Lovely reindeer and the background is gorgeous. Luv how this one turned out, you did good GF!